[175 Pages Report] The proactive services market is projected to grow from USD 1.47 Billion in 2016 to USD 4.35 Billion by 2022. The global proactive services market is expected to grow at a Compound Annual Growth Rate (CAGR) of 21.6% during the forecast period. The forecast period has been considered from 2017 to 2022, while 2016 is considered as the base year for estimating the market study. The main objective of this report is to define, describe, and forecast the proactive services market on the basis of segments including application, technology type, service, organization size, vertical, and region. The report provides detailed information regarding major factors (drivers, restraints, opportunities, and industry-specific challenges) influencing the growth of the market. The report forecasts the market size with respect to 5 main geographic regions, namely, North America, Europe, Asia Pacific (APAC), Middle East and Africa (MEA), and Latin America. The report profiles key players and comprehensively analyzes their core competencies. This report also tracks and analyzes competitive developments, such as mergers and acquisitions, new product developments, and Research and Development (R&D) activities in the proactive services market. The research methodology used to estimate and forecast the proactive services market begins with the collection and analysis of data on key vendor product offerings and business strategies from secondary sources, such as OneSource Business Browser, D&B Hoovers, 10K Wizard, Bloomberg, Thomson StreetEvents, Factiva, IT service providers, technology providers, press releases and investor presentations of companies, white papers, technology journals, certified publications, articles from recognized authors, directories, and databases. The vendor offerings have also been taken into consideration to determine the market segmentation. The bottom-up procedure was employed to arrive at the total market size of the proactive services market from the revenue of the key market software tool providers and service providers. After arriving at the overall market size, the total market was split into several segments and subsegments, which were then verified through primary research by conducting extensive interviews with key people, such as Chief Executive Officers (CEOs), Vice Presidents (VPs), directors, and executives. The proactive services ecosystem comprises vendors, such as Cisco (US), Hewlett Packard Enterprise (US), Microsoft (US), IBM (US), Ericsson (Sweden), Juniper Networks (US), Huawei (China), Nokia Networks (Finland), Avaya (US), Fortinet (US), Symantec (US), DXC Technology (US), and McAfee (US). 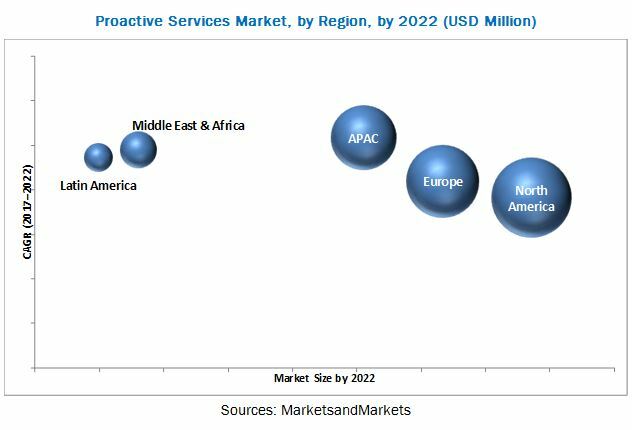 The global proactive services market is expected to grow from USD 1.63 Billion in 2017 to USD 4.35 Billion by 2022, at a Compound Annual Growth Rate (CAGR) of 21.6% during the forecast period. Several factors such as the growing need to reduce unplanned outage and to enhance customer value proposition, and growing instances of cyber-attacks are spurring the demand for proactive services. Moreover, an increased adoption of proactive services by several industry verticals, such as telecommunications, retail, BFSI, and healthcare, is expected to boost the proactive services market growth. In today’s changing business requirements, customers are looking for innovative solutions and services to manage their IT infrastructure and prevent it from downtime and any unplanned outages. Any unplanned outages in a large IT infrastructure of an organization will lead to a significant loss. Industry participants make use of Artificial Intelligence (AI) and analytics solutions to offer proactive support to assist organizations in identifying and resolving issues before they occur. For most organizations, IT is a significant pillar that requires cost-effective implementation of security service dynamics. However, at the same time, IT is the backbone of a modern organization’s processes and the data flowing within it is highly important, further making it difficult to ignore the IT infrastructure. Maintaining an IT infrastructure, which is secured from physical as well as virtual threat, is highly expensive. Cybersecurity vendors are offering services to identify and proactively prevent cyber-attacks. The proactive services market research report outlines the key trends, and market sizing and forecasting for various emerging subsegments of the proactive services market. The report also emphasizes on key global adoption trends, future growth potential submarkets, key drivers, competitive outlook, restraints, and opportunities of the proactive service market ecosystem. It also provides insights into the current and future revenues of market from 2017 to 2022 and is aimed to provide the reader with an understanding of market drivers, current and upcoming players, and the competitive landscape. The global proactive services market has been segmented by 5 major geographic regions: North America, Europe, Asia Pacific (APAC), Middle East and Africa (MEA), and Latin America to provide region-specific analyses in the report. North America is estimated to have the largest market share and is projected to continue to dominate the market during the forecast period. The adoption of proactive services is increasing in APAC and MEA, due to the rising IT spending and increasing digitalization. Growing use of mobile devices and the popularity of the Bring-Your-Own-Device (BYOD) concept in various companies are the main factors responsible for cyber-attacks and security concerns. Proactive services provide many benefits, however organizations feel that deploying proactive services would result in the loss of control over their own IT infrastructure and hamper their privacy. Major vendors of proactive services across the globe are Cisco (US), Hewlett Packard Enterprise (US), Microsoft (US), IBM (US), Ericsson (Sweden), Juniper Networks (US), Huawei (China), Nokia Networks (Finland), Avaya (US), Fortinet (US), Symantec (US), DXC Technology (US), and McAfee (US). 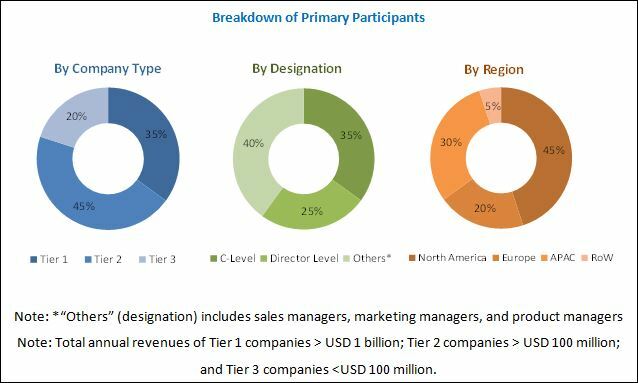 These vendors have adopted various organic and inorganic growth strategies, such as new product launches, partnerships and collaborations, and mergers and acquisitions, to further strengthen their position in the proactive services market.